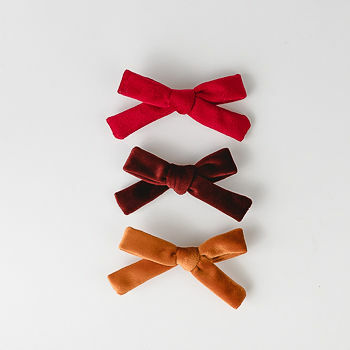 Three stunning velvet hair bows in red, burgundy and rust. All the brightest of colours and the softest of fabrics. Simple but stunning. Our hair bow packs are delivered in a beautiful pink box, perfect for a princess. Free delivery. Gift message options are available at checkout.